Ailurophobia is the chronic and irrational fear of cats. It is one of the phobias. This almost unpronounceable of words comes from the Greek aílouros meaning cat and phóbos meaning fear. People who suffer this phobia might fear bites and scratches (that I argue is not irrational but unreasonable – see below). The fear originates in the unconscious mind as a result of perhaps an earlier incident that traumatised the person. But it would seem that there are many possible causes and that the condition is not fully understood at 2010. In one case the patient with ailurophobia watched her father drown a kitten in a bucket when she was 4 years of age. This may have been the root cause of the fear. The fear was such that she panicked at the sight of a cat. She was eventually cured (in my words) by desensitizing her by gradually bringing her into contact with cats or objects that are associated with cats such as fur rugs etc.1. In another story a women was cured of ailurophobia through hypnosis (see extract above). Ailurophobia is considered curable through psychiatry. Although, if I am correct in saying that it is a case of unreasonable behavior and not irrationality then psychiatry is the wrong tool. It would be education and positive experiences that would cure the sufferer. In an interesting study from 1975 in Iran2 (it was a different place then), darkness, nyctophobia, necrophobia, ochlophobia, ailurophobia and pet animals and fear of cancer and syphilis accounted for 79% of the phobic cases studied. So, in Iran at that time a fear of cats is one of the top phobias. There is a lot of superstition surrounding cats. The black cat can do almost anything that is supernatural be it good or bad! 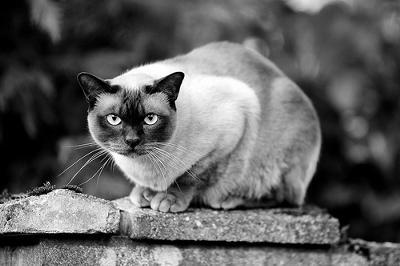 This superstition, which is embedded in our history is a fertile ground for developing a fear of cats. Medieval England contained many rampant ailurophobes. It is argued that a dislike of cats is essentially a fear of cats3. I agree this. When it becomes a disease or illness it is most usually found in women it is said4. It is also said by the same author that phobias originate in a conflict between animal desire and moral feelings. Homosexuality features in cat-haters5. Ailurophobia is the chronic and rational albeit unreasonable fear of cats. Is it the underlying cause of the extinction of the tiger? And the gradual inexorable extinction of all wild cats for that matter. Some wild cats are supposedly plentiful in numbers (Asian leopard cat for example) but in the long term there is only one way for them to go..downwards, if we remain on the current road map. And is a fear of cats irrational? Could the the whole definition be wrong? Cats, even, domestic cats, can be frightening to quite a lot of people. People are frightened of the agility, speed, guile and sheer ability of the cat, a classic predator equipped beautifully for the task. People are frightened of the sharp claws, long canine teeth and strong bite. There is reason for the potential for fear of cats to exist but the cat can equally fear us. We are, after all, the world’s top predator. It cuts two ways. At a fundamental level it is not irrational to fear a cat but it is only those who fear cats that end up fearing cats, it is circuitous. If you fear cats you mistreat a cat; you mishandle a cat, have the wrong attitude towards cats and that means the cat will behave in a defensive way, which means getting hurt. If you respect the cat, are confident with cats, understand cats, there is nothing to fear. This extends to wild cats. A lot of people in the USA fear the cougar (the mountain lion) and at the first opportunity shoot it! I remember a story in the press not so long ago of a cougar sunning itself on someones front garden (the cougar sadly has, in places, lost its fear of us) and the house owner shot it. No reason on earth to do it as this wildcat can be chased away. It is indiscriminate killing. The only reason can be an underlying fear and it looks irrational (see Mountain Lion Attacks). But humankind to be honest has the potential to be pretty much frightened of anything. I don’t think it is irrational as the definition of ailurophobia states. It is just a crude survival instinct. If you aren’t sure and think you might get hurt, or don’t understand it (and if you don’t understand it you are more likely to be frightened by it) — kill it. That is the unwritten motto. I also remember seeing a video on YouTube of a leopard (the common leopard) chasing through a village in India. It was obviously frightened and out of its comfort zone. It could have been left alone, people could have steered clear but, oh no..we gotta kill it! It was of course killed. An irrational fear of cats? No, this was a rational fear but a misplaced fear I say because the leopard can be avoided. The cougar is quite retiring and shy6 and the glorious tiger has killed an incredibly small number of people considering what could have happened. It generally avoids people. It is people who create the conditions under which a fear of it exists. If we fear it we attack it or run from it (the tiger attacks from the rear so this is bad news) and that can only produce the classic tiger response which elicits more fear from us. So ailurophobia is not the chronic and irrational fear of cats. It is the rational fear of a fine predator but we are a better predator and we create the conditions under which our fear is generated. That initial fear probably originates in a bad childhood experience when as a child we inadvertently and innocently mishandled a domestic cat and got hurt. This fear can be treated through psychiatry (it is said). And fear created this way is our fault. It is also said that Napoleon, Hitler, Genghis Khan and other ruthless dictators have suffered from ailurophobia but there is no evidence to support this. But there may be a vestige of truth in it. A dictator has to get his own way. He forces situations to suit his interests. A cat cannot be forced to do anything and if you try you get hurt! In the cat refusing to be forced and the human getting hurt the person will dislike the cat despite the person being the author of his own injury. Dogs obey the master and didn’t Hitler have a dog companion? Yes, he was named Blondi. I am sure that there is a large overlap in usage by laypeople between an unreasonable fear of cats and a pathological fear that is deep rooted in the unconscious. I love cats, but the lady who lived across the road from us was afraid of them. When she was a very young child, someone threw a cat on her near her face. She was very kind, but avoided cats. (I don’t doubt she also avoided the twit who threw the cat at her. Michael’s article seemed to insinuate that ailurophobes might mistreat cats. As an ailurophobe I would say that that seems illogical. If I can not even get myself to pet a cat, or touch it how would I ever get myself to mistreat it(which would usually involve physical contact)? even if I were inclined to do so. And it is true that most of us don’t hate cats. Despite my fear, for the last year and a half my partner’s mother’s cat has been living in our house since she moved to a nursing home and later died. O.J. still lives with us because I didn’t want to see him placed in a shelter, but I am still afraid of him and any cat. He largely avoids me. But I think most people afraid of cats wouldn’t hurt them just as I don’t hate spiders and want them dead, I just don’t want them around. This entry was posted in Human to cat relationship and tagged Ailurophobia, cat facts, fear of cats by Michael Broad. Bookmark the permalink.